Blackfriars closed over Christmas for an extended blockade. This was to allow the through tracks from City Thameslink to London Bridge to be slewed from the west to the east side of Saint Pauls Bridge ,eliminating the conflicting movements between trains going to and coming from the direction of Herne Hill and Elephant and Castle and the spur over Borough Market to London Bridge. 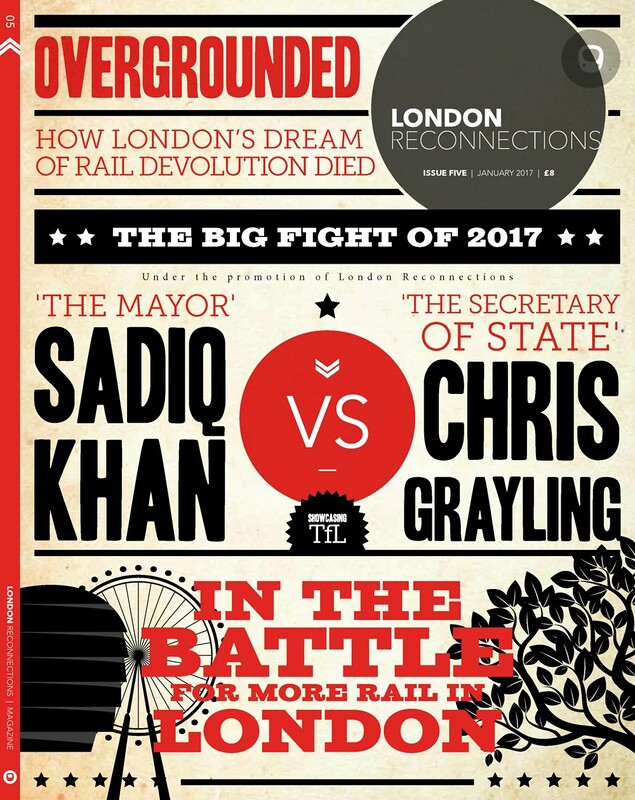 On the last day of public operation prior to the closure James Robinson went mud larking on the banks of the Thames to take a final look at the station before the big Christmas push. Our thanks and copyright acknowledgements to him for our first six photos. 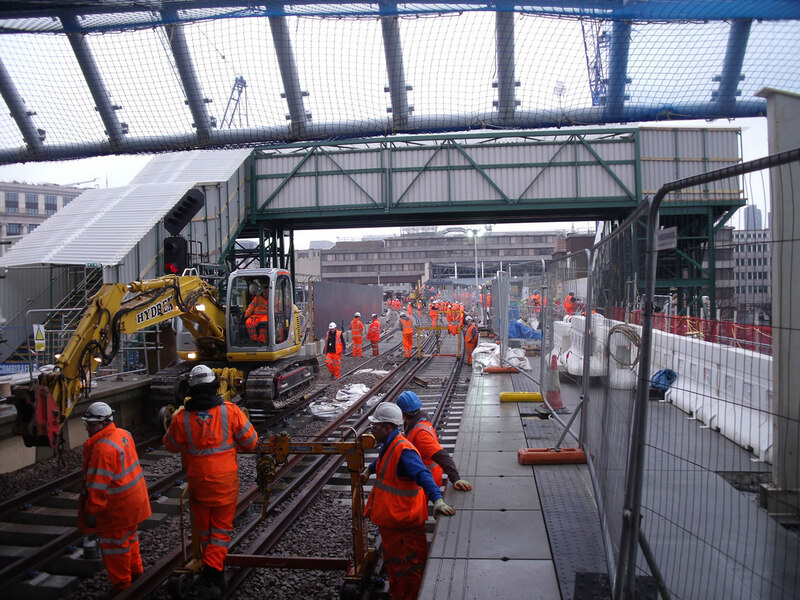 Our second set of photos come courtesy of Balfour Beatty Civil Engineering Ltd / Network Rail, and give a good idea of what was involved in the blockade work itself. 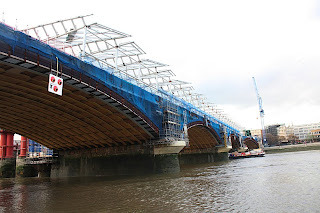 Above is a look towards Blackfriars from the rear of a northbound train back from City Thameslink. The top of the sky slope gradient down can be clearly seen beyond the diamond crossover. 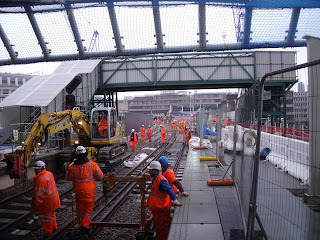 The bridge and tracks north of Blackfriars have been modified a number of times. 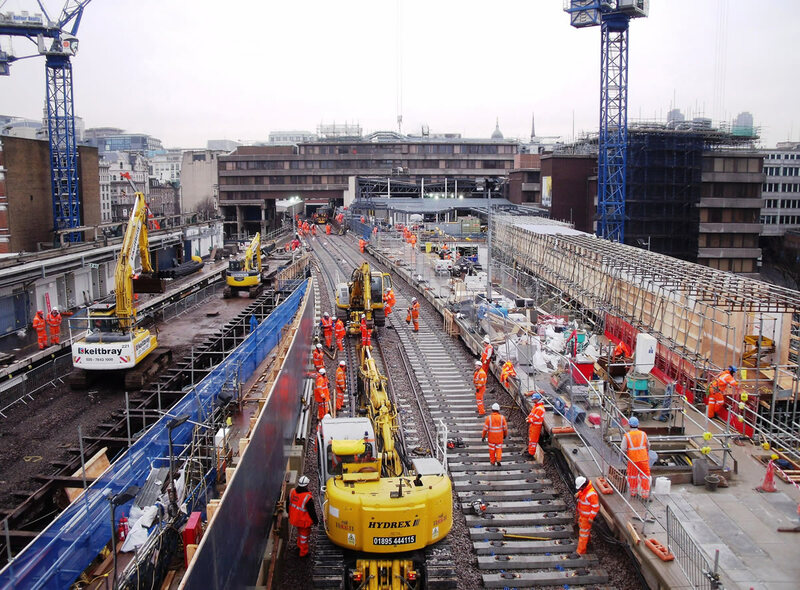 Until 1988 the tracks run on to Holborn Viaduct with the Farringdon line junction just to the north on the Great Victoria Street Bridge – In May 1988 as part of the staging works for the closure of Holborn viaduct it was moved 150 metres north and renamed Apothecary Street Junction. 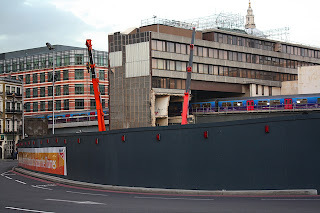 This lasted for barely a year until the existing Great Victoria Street bridge was lowered by one metre to give the characteristic 1 in 29 down gradient to the new City Thameslink Station. 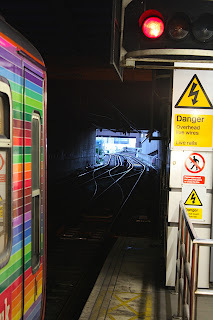 Crossing to the north west side of the station, the protective shell over the District and Circle LUL lines can be seen here. Full construction here will begin shortly. 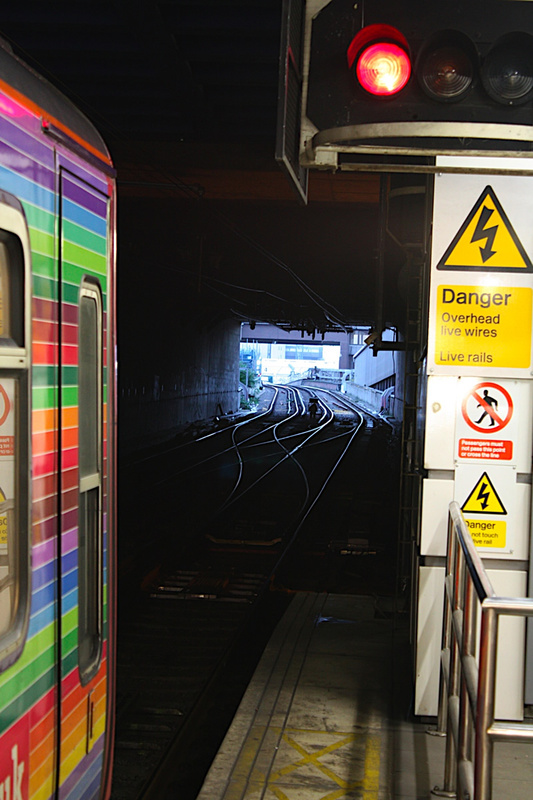 The marked change of gradient can be clearly seen as a northbound FCC train leaves Blackfriars. 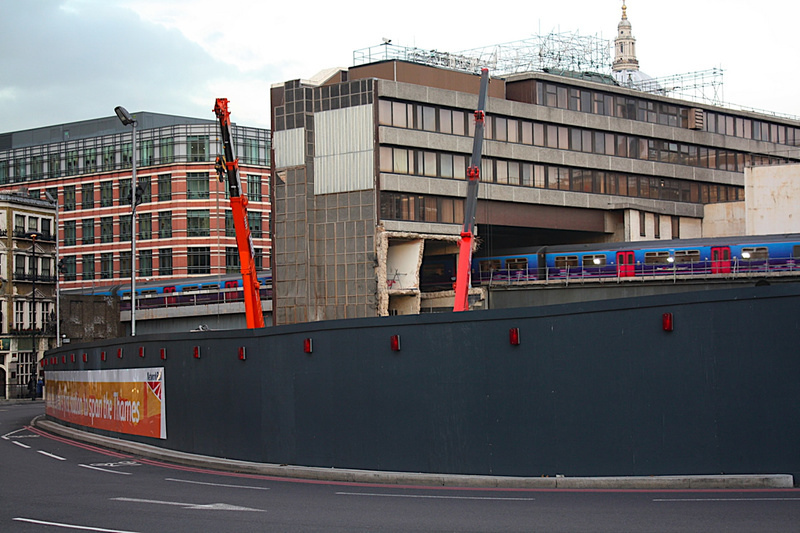 The office building at Puddle Dock spanning the tracks is scheduled for demolition. 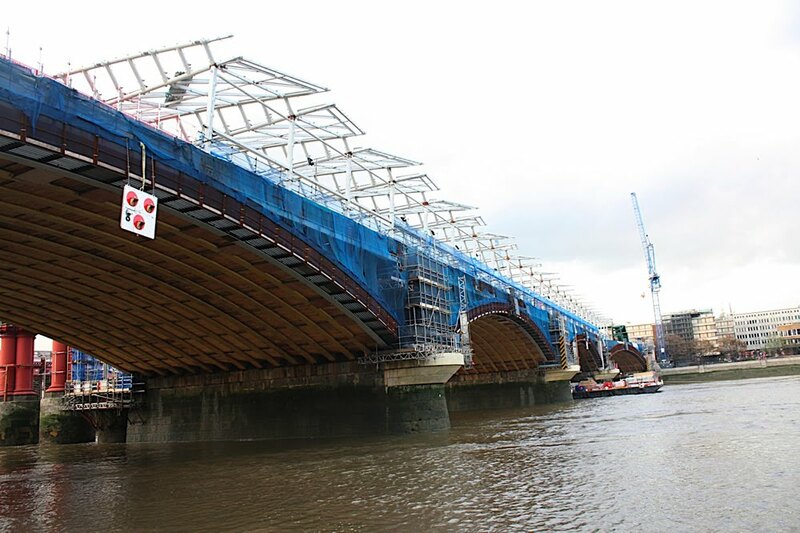 Taken from the south west side of the bridge, the temporary contractor’s access ways from Blackfriars Bridge to the piers of the original June 1864 bridge can be seen. 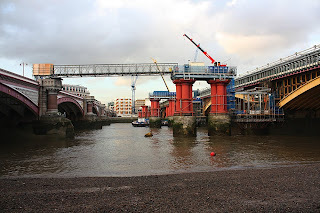 The original bridge deck was removed in 1985 and all traffic diverted to the parallel Saint Pauls Bridge which originally opened in May 1886. 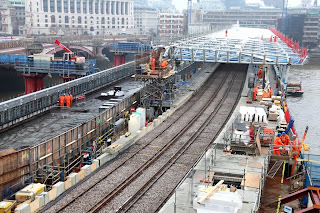 The first of the Balfour Beatty Civil Engineering Ltd / Network Rail images, the photo above was taken on the 28th December looking North, and shows the track already slewed and linked to the track in place on the eastern side of the bridge. 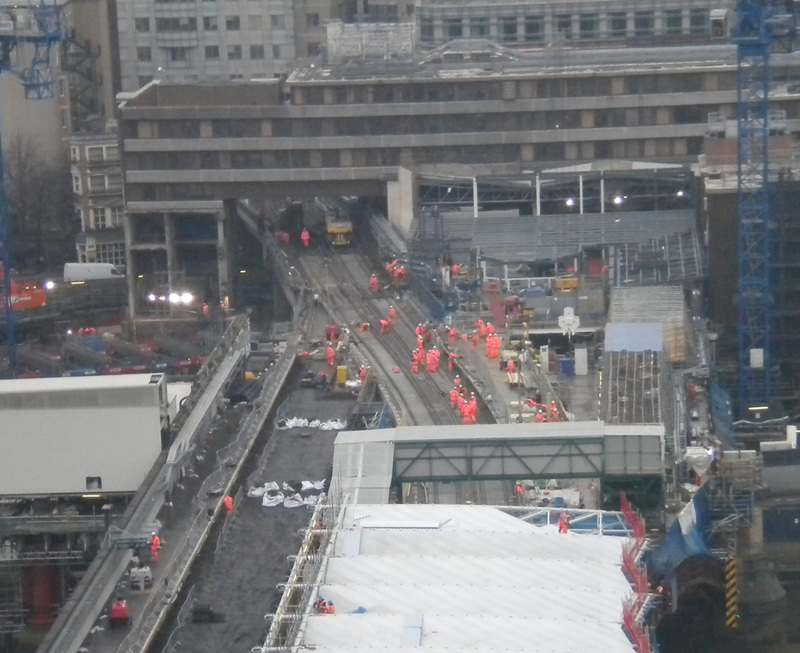 Again looking North, this image shows the completed trackworks through the new platforms, with work in progress on the roof panels. 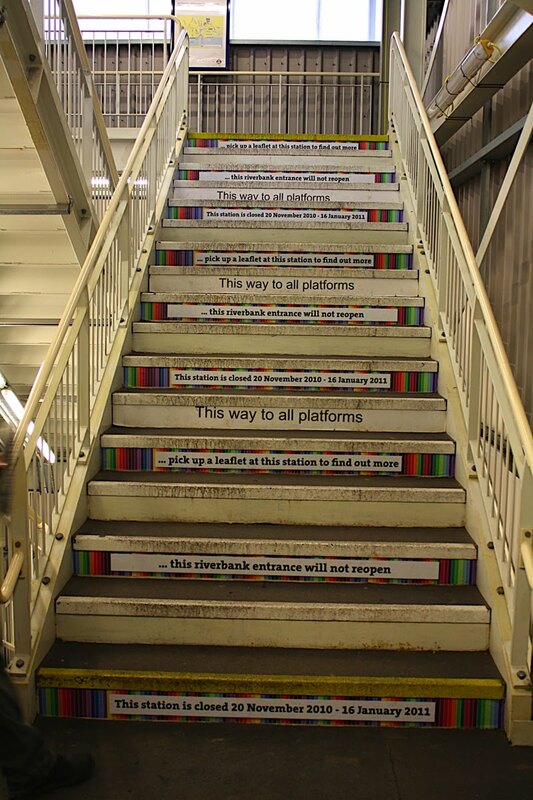 These need to be in place by the middle of the month, with the first train due to stop in the new platforms on the 17th January. 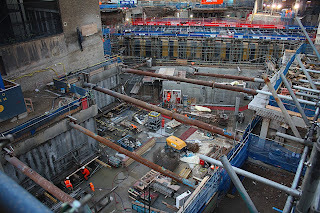 By the time this picture was taken, the track had been completely removed on the western side and some facings are in place for the southern end of the platforms. These will stretch the full length of the bridge when complete. This photo appears to have been taken from atop one of the site cranes. Again, by this point the track on the western side through old platforms had already been lifted. 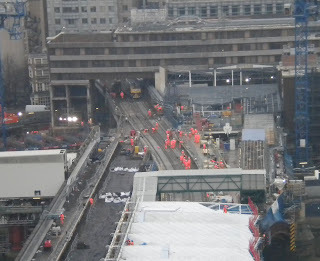 Finally, this photo gives a nice view of the work at track level. 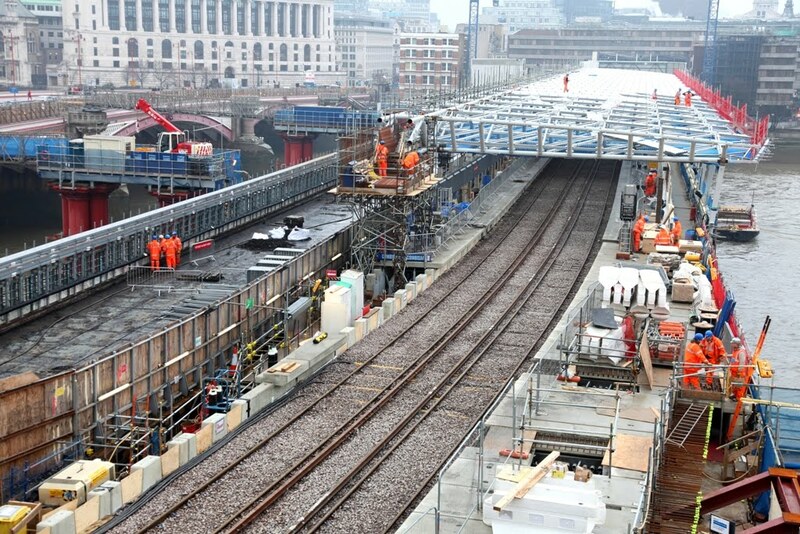 Also visible are the new temporary footbridge and the third rail in place on right hand track. It’s also interesting to note just how many frères (and sœurs) were required during the blockade to complete the work.